The VR Indie Pitch 2017 roadshow came to a climax at XR Connects Helsinki this month, after previous contests in London and San Francisco. 10 hopeful teams of varying sizes took turns to pitch their projects to a panel of expert judges including Curve Digital’s Head of Studios and Focal Point regular, Brynley Gibson; Virtual Arts’ Ryan Booth; Robert W. Heubel, Gaming Business Development Lead at Immersion; and some bearded journalist called Takle. Heubel observed that, “If you were a fly-on-the-wall during the judges’ final review, you’d truly be impressed by the amount of spirited debate that ensues... most judges are passionate gamers themselves and want to see these developers succeed”. 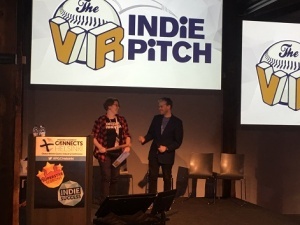 You can read more of Heubel's thoughts on being a VR Indie Pitch judge here. The only game to receive a vote from every judge, Drive Ahead! Minigolf by dodreams was the clear winner of this year's VR Indie Pitch Helsinki. Despite the panel asking whether the world really needs another mini-golf game, the consensus was that yes it does - when it’s this much fun. 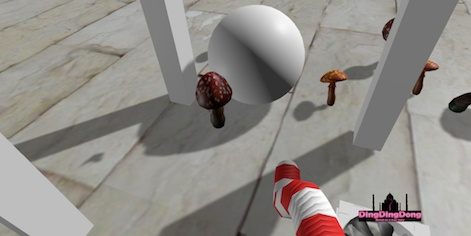 The game uses Apple’s ARKit to overlay procedurally generated mini-golf courses on the real world, with the welcome ability to save favourite holes for repeated play. The game was developed over two months by a team of two that grew to five during development. Initially released with up to four-player local competitive gameplay – which the judges enjoyed on the day - dodreams plans on adding online play after launch. They’re already catering to the existing Drive Ahead! Online community with the functionality to share gameplay GIFs via social media. Smart stuff. Brynley Gibson said that, “The brilliance of Drive Ahead! Minigolf is its simplicity of concept married with excellent execution. Yes, it’s ‘just’ AR minigolf, but it’s been done just right. The simple laying out of AR courses will have you wanting to play a massive game with friends laid out in pub car park. The motion controls shouldn't work, but they do - extremely well! Finally, it’s naturally social; you can pass and play the device and look over each other’s shoulders. Now it just needs a windmill obstacle (and a course creator) added and my life is complete”. Drive Ahead! Minigolf is out now for iOS via the Apple Store. The judges enjoyed this 1v1 spellcasting ranged combat game as we duelled against another player who was in the firm’s Berlin studio. (Although we strongly suspect they gave us an easy time of it.) There’s also an offline AI mode. Elemental Combat is a first-person game where players can bend or manipulate the elements of fire, air, wind and water in VR. Control is through martial arts movements to attack or defend that vary by element. Set in the mountains of the monks that guard the secret techniques for mastering all the elements, players can unlock new abilities and choose the element and abilities that suit their play-style. Defensive moves feel mighty, as you raise the ground in front of you to form a defensive barrier – but who could resist throwing Hadouken shapes to launch offensive fireballs? We certainly couldn’t. 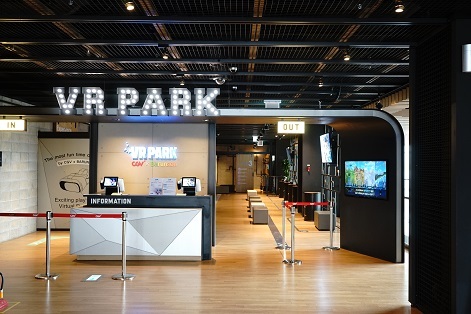 Avrlon hopes that the game’s combination of action and strategy will see this game become a major competitive VR eSport title. Brynley Gibson said, “Tapping into our superhero fantasies to be able to hurl balls of energy or tear rocks out of the earth, this is a natural fit for VR. I liked that this game will require real skill and learning to master - and it’s that level of skill and movement that adds an extra level of immersion”. David Gattig, CEO and Co-Founder shared his thoughts on the experience of competing in the VR Indie Pitch, “It was extremely exciting for all of us at Avrlon, since it was the first time we actually dared to showcase Elemental Combat in front of high calibre judges in an official setting. “Later that same day, when I arrived home to Berlin and stepped into our little office with my bag in one hand and the certificate in the other [Elemental Combat was runner-up], the sheer joy of the whole team hit me like a truck. “We all lay in each other's arms and, to be honest, no eye stayed dry. We all quit our jobs to pursue this dream. We put our hearts and souls into this project. We were so relieved to hear that our efforts of the past year while living off Yum Yum noodles and powering through late night crunch times were worth it. “In the end, it showed us that, even though we still have a long way to go, we’re on the right track”. Elemental Combat will be available for Rift and Vive this November, with PS VR to follow. Trains VR was inspired by the model railways that everyone seems to love. It’s an attractive looking puzzle game from The House of Fables, where players try to navigate their train from a start point to an objective without crashing into other little locomotives. Rewards are on offer for the shortest possible route or for creating the most scenic possible route on the level. And yes, you can ride onboard as your train chuffs its way to the destination. The House of Fables’ founder said of the VR Indie Pitch that, “I'm glad we could participate. I've seen great titles from folks around Europe and it's always inspiring to share game ideas with people working on - and going through - similar challenges. “Especially when you work on cutting edge technology and nothing is set in stone, there aren't any ‘design patterns’, proven UX solutions and so on. “One of things that’s both exciting and frustrating in XR is that finding a solution might take weeks, but when you finally get it - it feels so obvious that it should have taken two hours to figure it out and implement! So mixing, talking and getting feedback is priceless - and from that perspective, the competition is a great opportunity to improve the experiences we work on”. Trains VR will be released early 2018. As Robert W. Heubel notes, “It’s the spirited judges debating and swaying of a single vote from one game to another game that finalises the results,” and that was certainly true for Taphouse VR, which missed out on a place in the top three by the narrowest of margins, causing a bit of a row amongst the judges in the process. Developed by Catland – one of the teams participating in the Nordic VR Startups accelerator programme - it’s a tavernkeeping game for the HTC Vive where your customers are angry dwarves. The objective is to mix drinks as the questionable clientele places their orders and you can read more about the game in our previous article. Taphouse VR will be released for Vive on the 18th October. 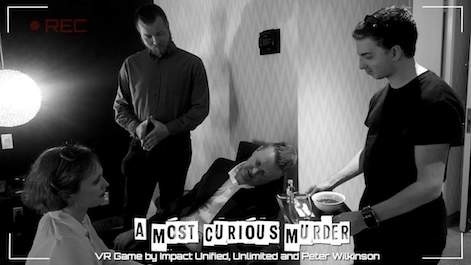 A late entry to the competition, but surely one of the most polished, A Most Curious Murder is a fully interactive mobile VR game where you are wrongfully accused of a murder. Of course, the only thing to do is to break into a police station to access information from 360-degree surveillance videos about the case and solve it to clear your name. The game is co-developed with Montreal VR production company, UNLTD, where the filming of the 360-videos was done. Immediately atmospheric, we have no doubt this first-person puzzle game will only reveal its highlights over time. The panel queried what the premise gained from VR, as opposed to a flatscreen treatment, but Impact Unified’s innovative locomotion system drew universal praise. A beautifully simple idea, the user walks on the spot to simulate in-game movement. Yes, you can just bob in place – or even nod – but that only spoils the fun for yourself. We only had time to access the first of the in-game video clips, but we look forward to discovering more of A Most Curious Murder’s hidden secrets on Gear VR and Oculus Rift. No release date has been set for A Most Curious Murder. Cat S Trophy Demo Teaser from Teemu Jäppinen on Vimeo. Cat S Trophy is a kitten-cute VR kart racer with a difference, in that players must draw their racing line before hitting the track. Developed by Visible Realms for Samsung Gear VR and Google Daydream, the judges thought the cartoon style was the cat’s miaow, but felt the handling and controls were in need of refinement. Cat ‘S’ Trophy will be released in time for Christmas. Inspired by a childhood love of ‘gamebooks’, Coming Home combines a physical book with an AR app where choices made in the game affect the narrative, pages and personality of the character. The AR overlay also allows the reader to solve puzzles to find out more about the world and unlock new characters. Critical Lit Games is a lone developer who has been working on the project since March. Coming Home is intended for release in early 2018. Players insert one Vive wand into their belt, with the other hanging by its loop and then... gyrate and thrust to manoeuvre a candy striped ‘hose’ in an attempt to hit in-game objects. Yes, it really is that simple and silly - and a sure-fire hit at parties. Planned as a compilation of minigames, we’d love to see similarly unusual uses of the wands, but hats off to developers, Lucky You Studio, for such an innovative approach to VR control. No release date has been set for DingDingDong. We’ve seen various builds of this winter fishing game over the last 12 months and with that much time in development, it’s every bit as polished as you’d expect. Ice Lakes has both single and multiplayer modes, with 15 open world maps from Japan and Finland to America, variable weather and time of day as well as seasons, 30 fish species and a wealth of equipment. Also playable on smartphone screens, you can play it in VR on Rift or Vive, with 189 Steam reviews and an overall rating of Very Positive. Ice Lakes is available now on the Steam Store for £10.99. This VR bowling game impressed the judges with its realistic physics and a genuine sense of mass to the balls. Some found the informative tablet glued to the user’s virtual left hand off-putting and wondered if the same UI wouldn’t be better served by a wall-hanging or free-standing display. Set in a series of 15 virtual bowling alleys with eye-catching lighting and reflections, Rising Fun Games’ Let’s Bowl VR is a single player game, with online multiplayer, but no local, which seems a missed opportunity for social get-togethers. Let’s Bowl VR is available now on Steam Early Access for £13.59. Thank You – And Goodnight! Thanks again to all the teams that took part in the VR Indie Pitch Helsinki. It was a pleasure and an honour to see your works-in-progress! Congratulations again to the winner, dodreams, and runners-up, Avrlon, and The House of Fables. We hope everyone found the event valuable, with usable insight from the judges and good practice for pitching to publishers or investors. The next VR Indie Pitch will be held at XR Connects London 2018, on 22nd and 23rd January. Could your VR, AR or MR project win? There’s only one way to find out – register now!